Caiman Hat Clips, a startup based in Carlsbad, CA, launched its newest product for hat collectors and enthusiasts worldwide on Kickstarter today. The Caiman Hat Clip is a hat clip with an unique, patented design that allows hats to be hung easily, efficiently, and without losing their form or getting creased. Engineered around form and function, the Caiman Hat Clip holds hats by their button as well as having a small hook so users can enjoy displaying and storing their hats without worrying about space or damage to their hats. For the past few months, the Caiman team has tested their prototypes and refined their design. After gathering feedback from hat collectors, enthusiasts, owners and target consumers from around the world, the Caiman team has perfected their design and is ready to take the Caiman Hat Clip to market. An organized, efficient closet is a good indicator of an effective individual. Hat-wearers may opt to hang their hats away in a closet, which will help them save storage space on the floor or in drawers, or hang them out on display to enhance a room’s overall taste and style. Depending on the number of hats an individual possesses, Caiman hat clips can save cubic feet of storage space and make hats more accessible for quick access. For those who wish to enjoy their hats without stacking or folding them, Caiman offers a way to store hats in a simple, elegant way. Caiman’s plastic grip and hook, available in white, gray, or black, is small and strong. On one side, a patented grip is ready to hold a hat by the button on top of it, letting hats retain their natural form and orientation while hanging. On the other side is a small simple hook. The hat will remain locked in the button even under considerable forces or changing orientation, meaning hats will stay attached hanging in vehicles or suitcases as well. 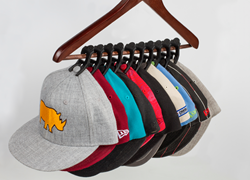 Up to ten hats may be stored on a single hanger using these clips. The Caiman team has worked hard to develop the perfect design that not only delivers, but is also aesthetically pleasing at a low price point. The Caiman team is now ready to distribute Caiman Hat Clips worldwide. To help jumpstart the mass manufacturing process, the team has turned to the Kickstarter community. Caiman Hat Clips, which are available in sets of 3, 10, 20 and even larger orders, are available to backers at a discounted price starting at only $5 per 3 pack of clips. The clips are expected to deliver this fall. For more information on Caiman, visit the campaign at bit.ly/Caiman_KS. Founded by Ian Kovacevich in 2017, Caiman is a Carlsbad-based startup with a primary focus on the headwear and clothing-storage industry. Their newest product, the Caiman Hat Clip, is a dual-sided hat clip designed to hang hats in a natural position for up to ten on a hanger. For more information on Caiman Hat Clips, visit bit.ly/Caiman_KS.